Kash’s garb is nearly finished. I am almost done with the machine sewing on his doublet and then its just lots of hand sewing. I marked out the slashes the other day and pinned the trim on to make sure I liked it. And while I was hoping to get the machine sewing done tonight, my day was more hectic than I intended for my day off so while I managed to get most of it done, its not where I wanted it to be. Forgive the crappy laptop picture, my phone decided to completely break today so I’m without it until tomorrow when the replacement arrives. Just need to make and add the peplum, sew down seams, sew on the trim, make 12 eyelets and add buttons. The slashes look a little wonky right now but I’ll be playing with them when I sew the trim which will hopefully help. Have 2 days to finish this to stay on my deadline, and since I have Sunday and Monday off I’m hoping to get a good head start on my dresses. Only 15 days until faire! Managed to find similar (though not completely exact) beads to finish off the braids of my belt. They’re a silver finish instead of the brass, copper and pewter finish of the original beads, but they’re the same size and design so its close enough. Finally got around to sewing the buttons on Kash’s pants so unless I decide to hem the legs, those are totally done. Cut out mock up pieces for Kash’s doublet and my bodice and go them all sewn together. Doublet looks perfect so that can be started for real. My bodice will need some modifications but its looking promising. Sunday I should be getting the pattern for my dresses fitted. I also finished my steuchlein, as well as started and finished a felted Tudor hat to go with it all. I think I’m going to have to adjust the brim of the hat a bit more, but otherwise I think its pretty well felted. So, costumes are coming together. I have a few adjustments/embelishments to make on some pieces but I don’t think there should be too much issue finishing everything. Faire is coming up quickly and I hope it can all get done in time. 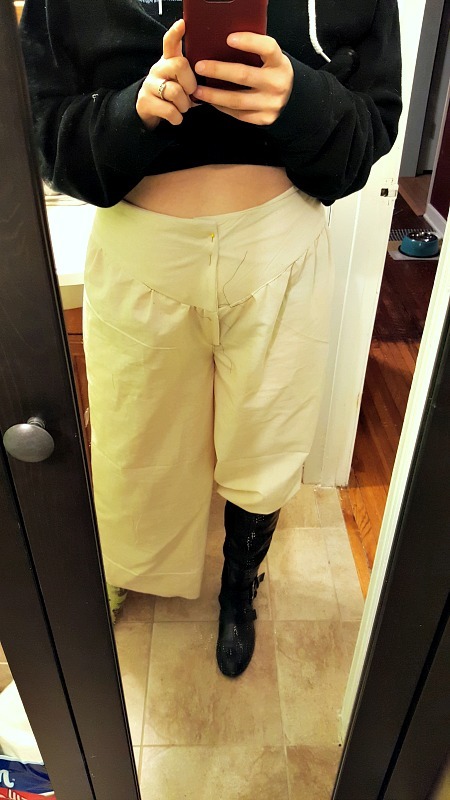 The pants and shirt for Larson are about 85% done and I just finished up the trim for his doublet. Need to get the doublet drafted and then I’ll be able to get that going as well. Neve isn’t far along at all, though I do have her belt done other than finishing the braiding at the end. My friend Kash and I are creating characters for Ren Faire, which means I get to build two completely new costumes and all the fun details that go with them. Its been a while since I’ve gotten to do this level of costuming so I’m looking forward to it! First up is the costume for Kash’s character, Larson. He’s never had a costume made before so its fun seeing his reaction to things. This is a rough idea of his costume. Our characters are not the most honest street people so I have some secret plans to go with that. Fabric has been purchased for the pants and shirt, though I still haven’t found the perfect doublet fabric. I’m hoping to make a pouch or two for him but that might be something he’ll end up having to buy. I started with a mock up of the pants since I didn’t trust my rusty skills and thankfully I did because I cut the wrong size. But at least that’s an easy fix! I tried them on myself after I finished them and hey, I can just use this size for myself! 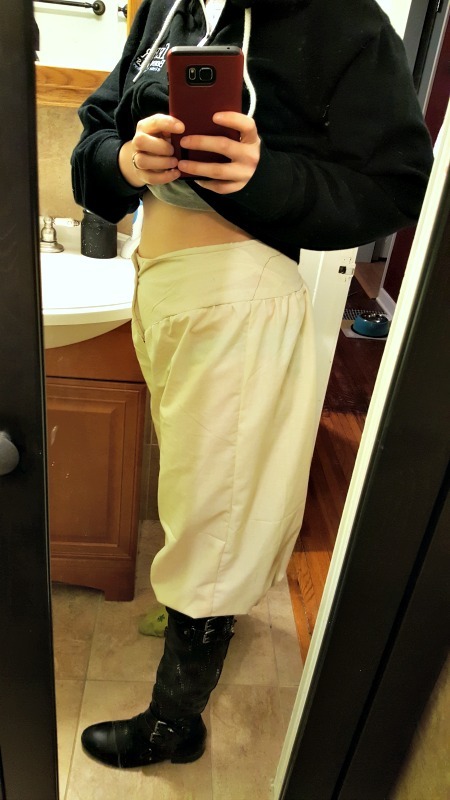 It won’t work for my character design but this is a comfy pair of pants and I will use them for something! There are lots of little details I’m planning on including that will be a lot of work for these two costumes, but I think that’s one reason why they’ll be so fun. I love stretching my costuming skills and adding new ones. I have to wait a few more days to get going on the pants for real but tomorrow I plan to work on the shirt and get that hopefully done in the mean time. Faire will be here before I know it!